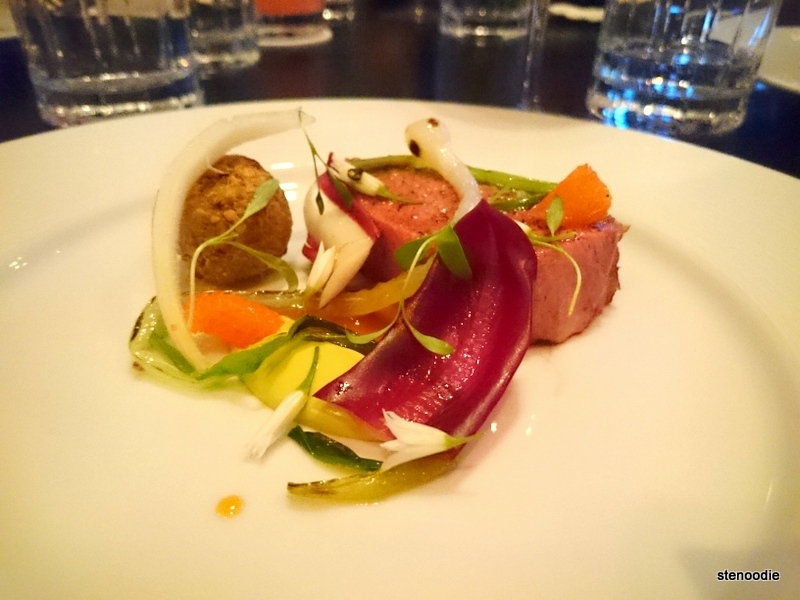 I had the privilege and rare chance to dine at Alo Restaurant with some serious foodies friends recently. 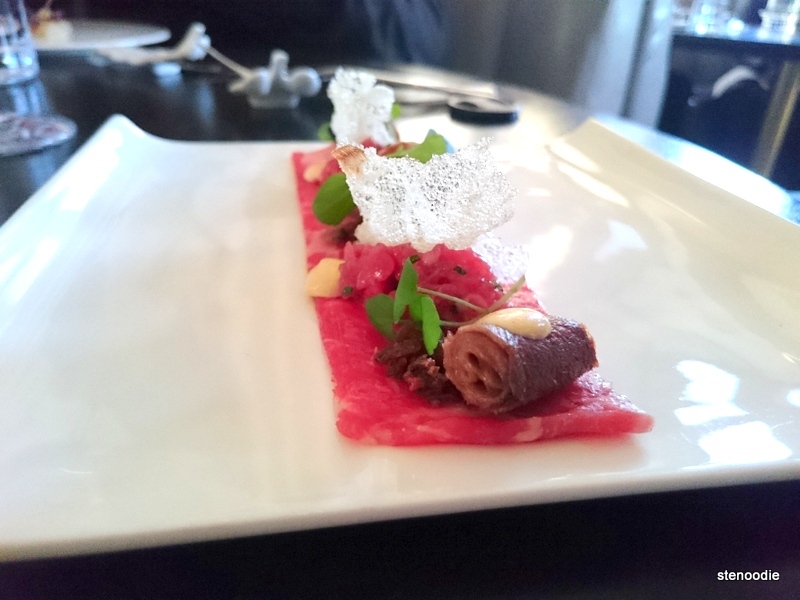 Alo Restaurant is a French restaurant that offers a tasting menu. It is located on 163 Spadina Road in downtown Toronto in the intersection of Spadina and Queen Street. 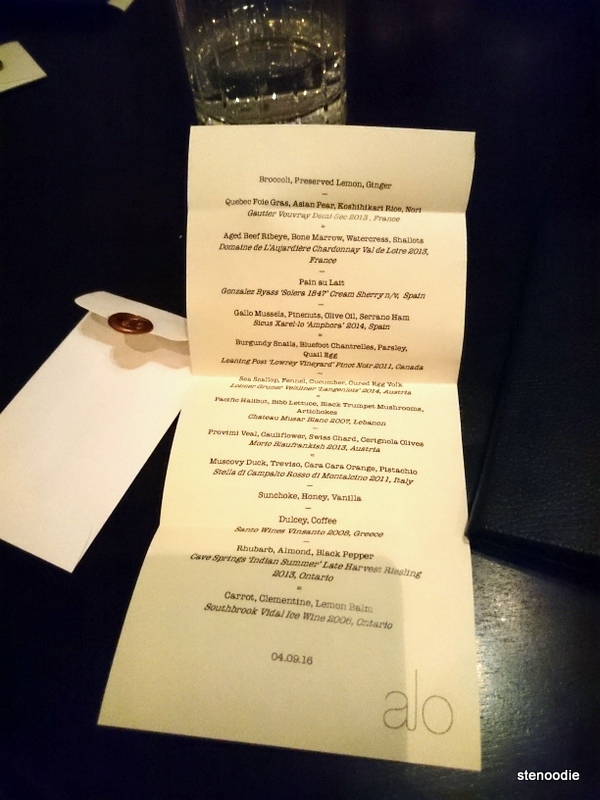 It is a restaurant that you have to make a reservation for (months in advance). We made the reservation back in mid-January and one of the first availabilities was for April; three months after the booking! This was a first for me as I had never had such a long waiting time for restaurant bookings before. This was some serious foodie restaurant! 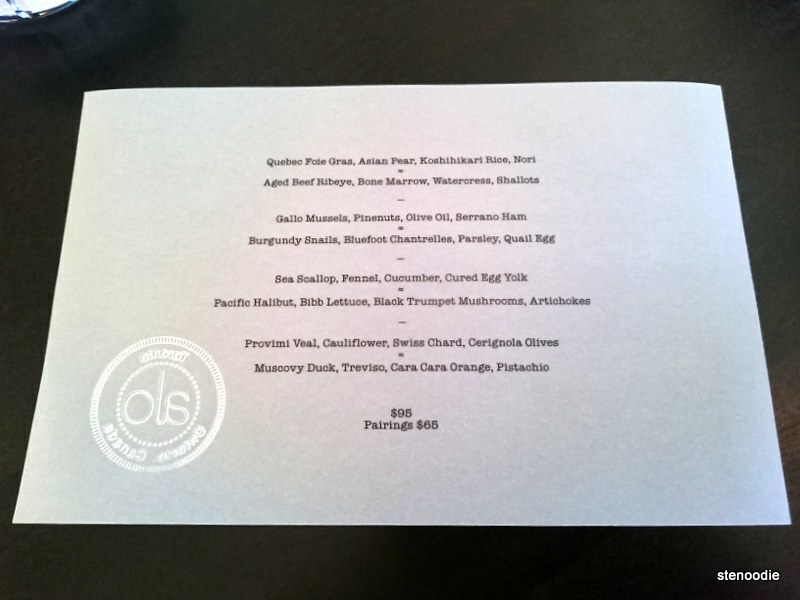 In addition to that, Alo Restaurant serves only a tasting menu. They are a French restaurant and their food is fine dining. There were five main courses that we got to enjoy. 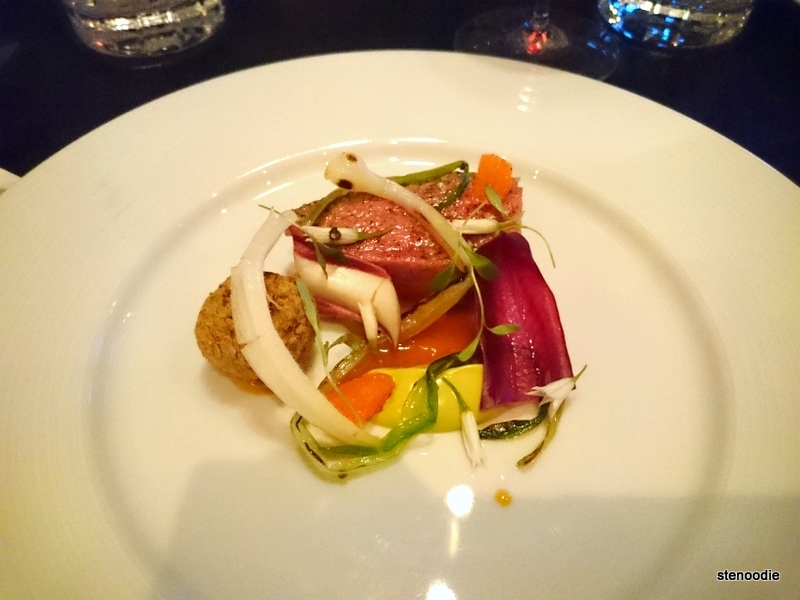 This blog post outlines my experience of dining at Alo Restaurant experienced on April 9, 2016. Right away, there was a hostess standing behind a stand who asked me whether I had reservations. I answered yes and informed her of the name and time of the booking. She informed me that my friends were there already and told me to take the elevator to the left of her to the third floor. What an interesting start to the meal! I entered the elevator and pressed “3”. It took a little bit of time for the elevator to crank its way to the top and for a second, I thought that I was going to be stuck in that elevator haha. When I walked out, there was another hostess that greeted me and offered to take my coat. She already knew what reservation I was there for and swiftly took my coat and handed it to someone else. She also noticed that I had a purse with me, and grabbed a purse hook from the table before leading me to the table where my friends were already seated. As I walked in, two servers carrying food stopped in their tracks and smiled at me to greet me and welcome me into the restaurant. That was very special and nice. 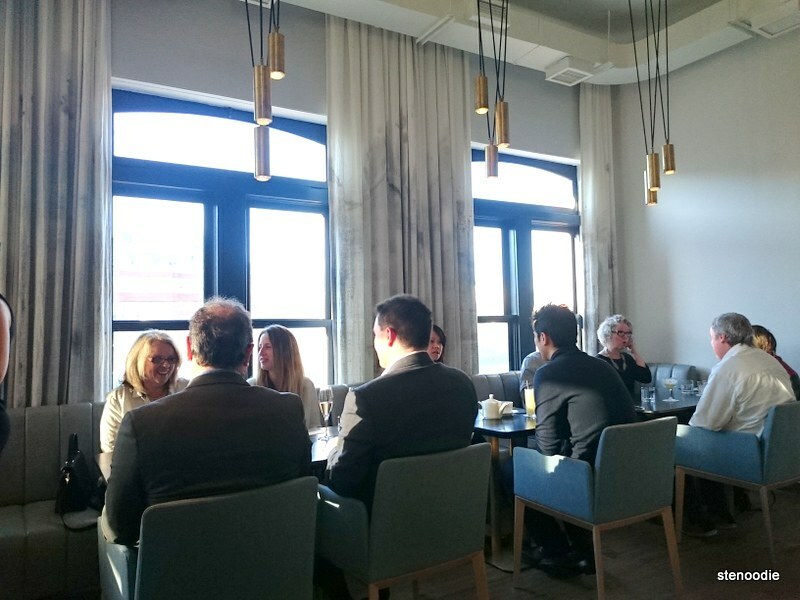 The atmosphere of Alo Restaurant was chic and clean with high ceilings and an open kitchen area where if you were seated at the counter, you could watch the chefs execute all of the cooking and food plating. 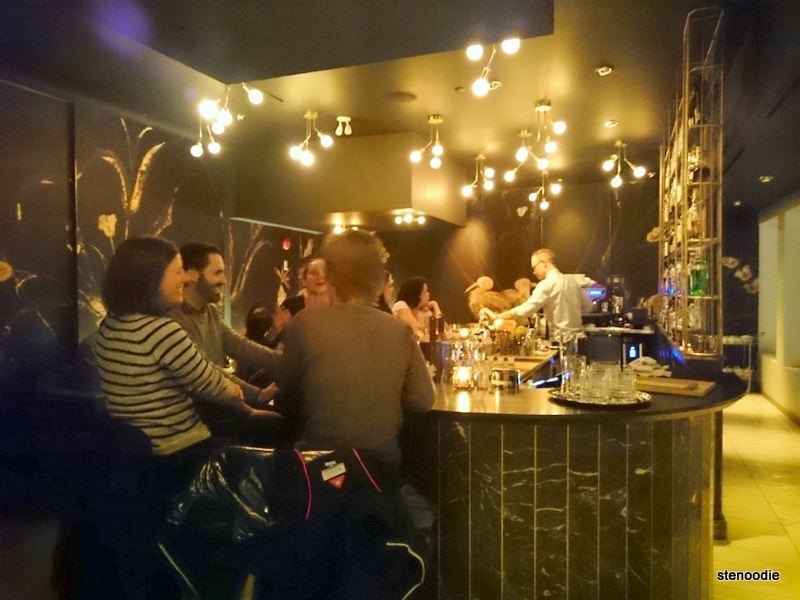 The area of the restaurant where I came out of the elevator actually was the bar portion of the restaurant (also leading to the individual gender-neutral washrooms that were hidden behind a sliding door). 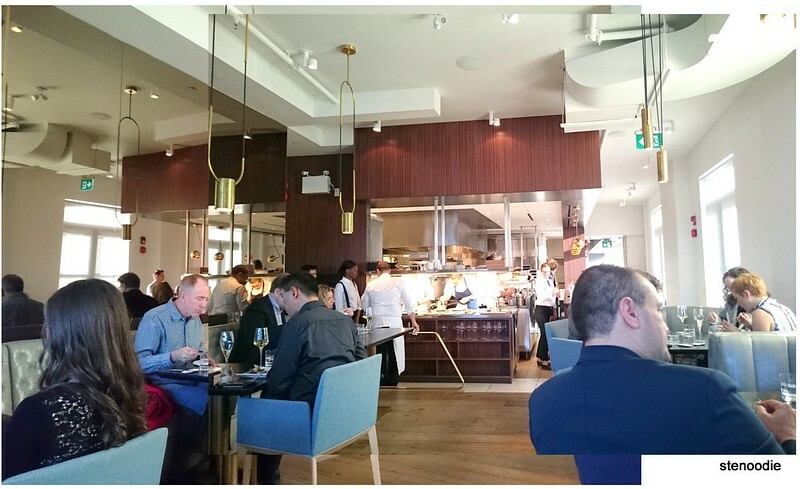 As Alo Restaurant is named as one of the top 100 restaurants in Canada in 2016; namely number six on their list, I expected nothing less than spectacular in terms of their customer service and attentiveness. I have been to previous restaurants of a high caliber before so I knew what to expect. Indeed they did this: the servers pulled your chair out for you when you sat down and also folded the napkins in your seat after a restroom trip. The crumbs were cleared from the table using a small tool and even when water from the water pitcher accidentally splashed onto the table when the server was refilling it, they brought forth a small purple cloth/sponge to wipe it up (with an apology too). The service was immaculate and professional. The server explained to us that there were four main dishes on the menu (with the dessert to be explained later). 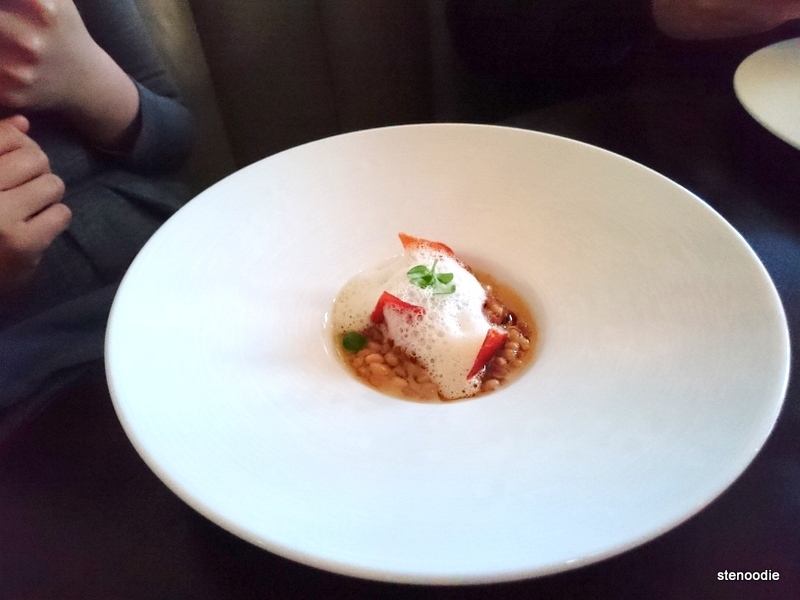 Each course had two selections to choose from — one richer in flavour than the other. He gave us a few minutes to decide on our choices before coming back to take our order. Looking at the menu and the two selections for each course made it really difficult to just pick one! Each selection looked amazing and I really wanted to try both. In the end, I picked the Quebec Foie Gras, Burgundy Snails, Sea Scallop, and the Muscovy Duck. Our dinner service actually started at around 6:30 p.m. and lasted until 9:30 p.m. from beginning to end. I wouldn’t say that the food arrived quickly but it was served in a logical amount of time considering that they gave us generous time to enjoy and savour each course with thorough explanation before moving on to the next. They didn’t rush us at all even though they initially told us at the time of booking that they would have to take the table back at 9 p.m.
First of all, we received some pastries to start. This was no ordinary pastry. These were French gougères with jalapeño cheese baked inside of it. We each got two servings each and this was absolutely heavenly. 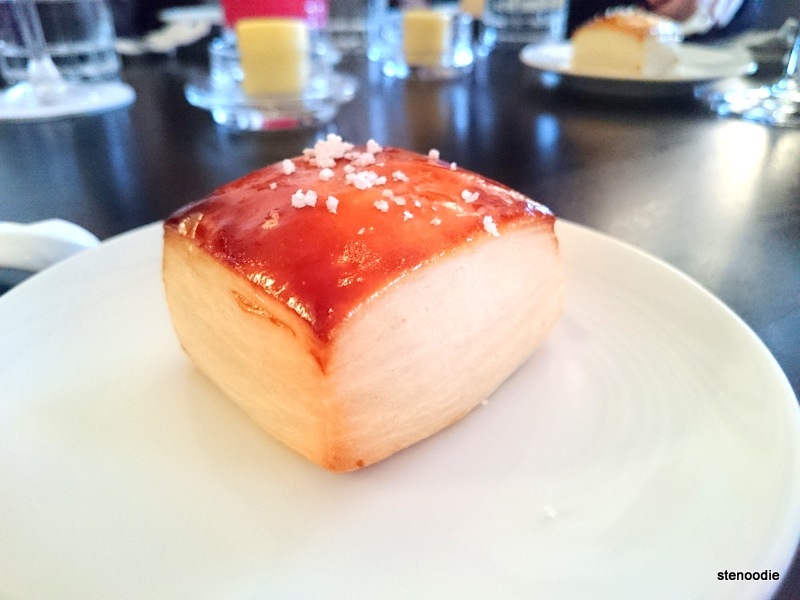 The little pop of flavour inside the pastry was indescribable. The creamy jalapeño cheese lingered in my mouth even after I swallowed it. It was so amazing the way that the abundant cheese popped with explosion in your mouth as you bit into the bread. Absolutely delicious! 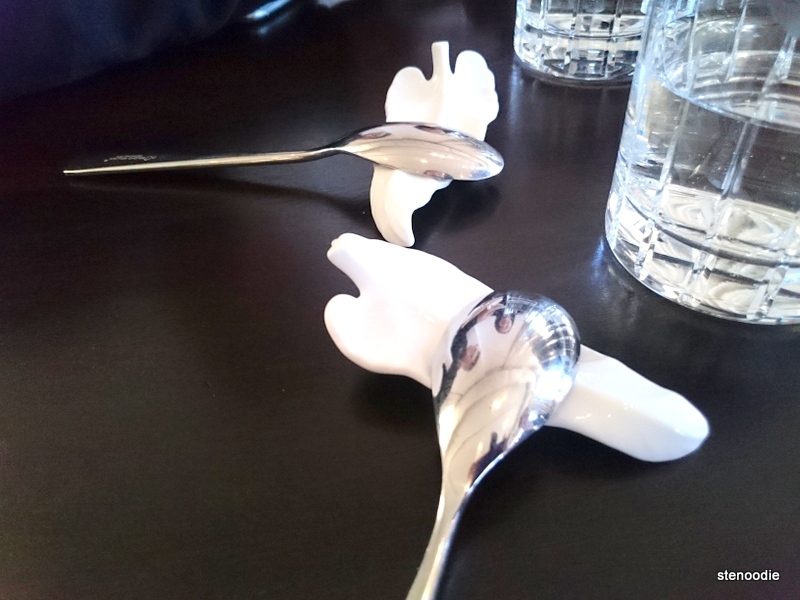 After and before each course, the server came around to our tables to set the clean utensils for us. The utensils were placed on a white leaf-shaped utensil holder. It was very classy and chic. I tried the drink that Gladys ordered. The Vodka Fix was beautifully presented and so girly and cute (hard to see a male drinking this to be honest). What I absolutely loved was that they used a metal straw in the drink. Way to go, environmentalists! 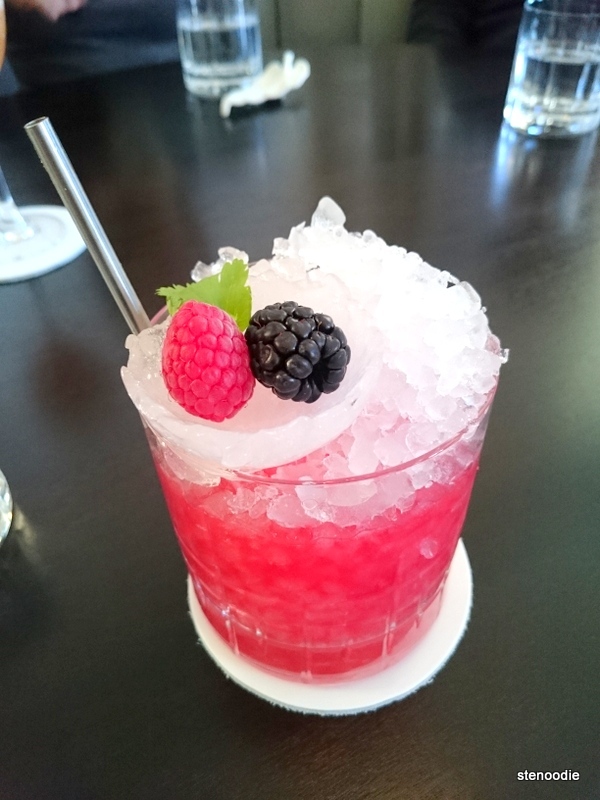 I tried a sip and found that it was very fruity and contained a hint of raspberry with an after taste of the alcohol. The detail of the ice was fine too. There was a small bowl carved into the ice on top of the drink to hold the blackberry and raspberry. Amazing. 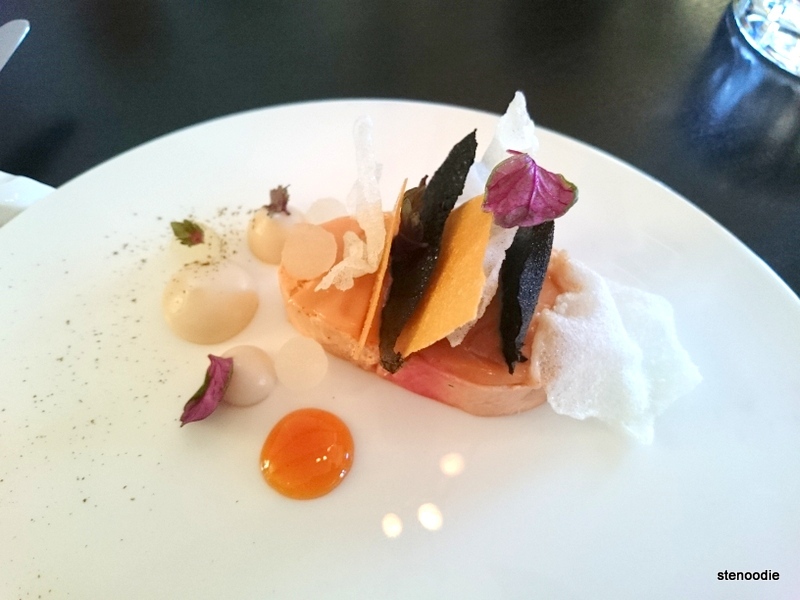 My first course of “Quebec Foie Gras, Asian Pear, Koshihikari Rice, Nori” arrived. Fine dining is all about the presentation and high quality taste. The presentation of this dish was artsy as everything was shifted to the side of the plate and overall, it actually looked like a bumblebee. Do you see it? There were yellow and black stripes on the oval body. The Quebec foie gras was so smooth and actually tasted like foie gras ice cream to me at first bite. It was just so incredibly smooth and didn’t resemble the typical grainy texture of foie gras to me at all. The Asian Pear was very juicy and in a tiny shape of a teardrop. Everything was so fine and minuscule. The Koshihikari Rice tasted like a rice cracker while the Nori was just dry seaweed. 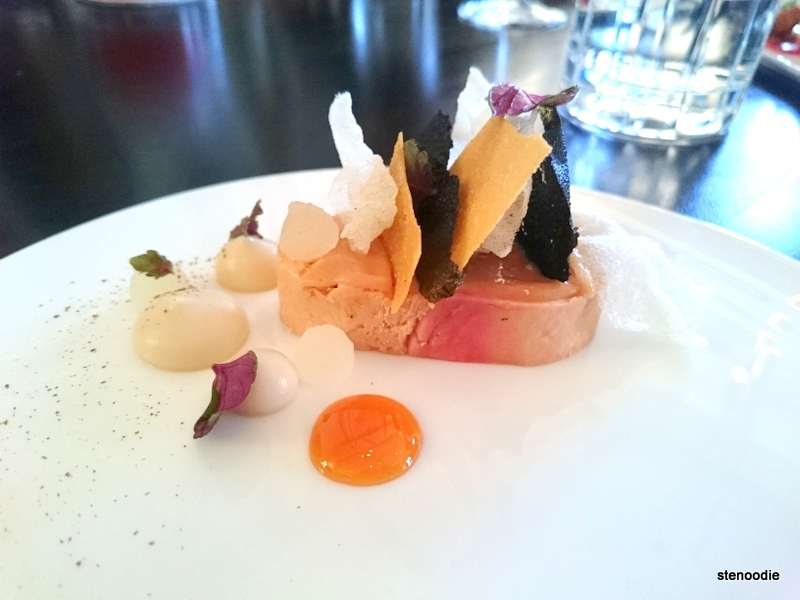 Overall, for this dish, I loved the texture of the foie gras and its uniqueness! 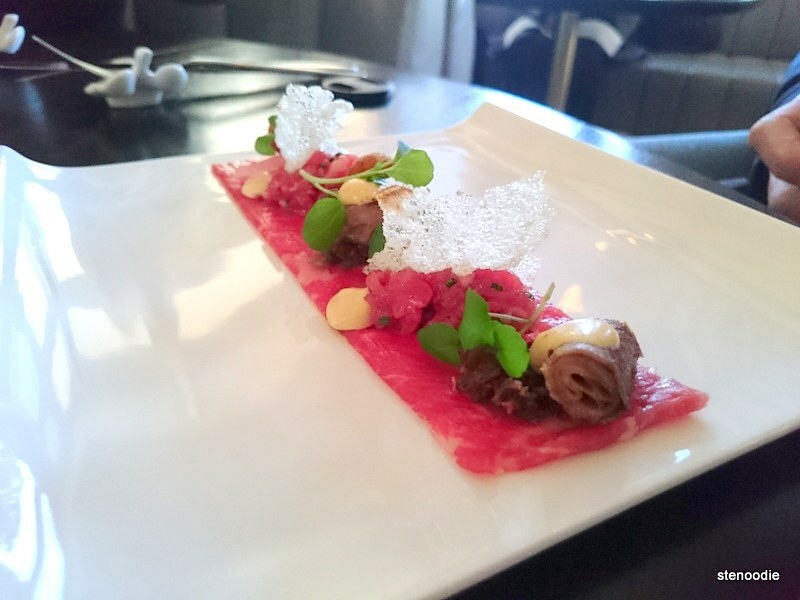 I also tried a bit of the “Aged Beef Ribeye, Bone Marrow, Watercress, Shallots”. This bone marrow was incredible!! The ribeye and beef tartare were also succulent and so tasty. I wish I had more of this and actually ordered this one myself! Also, the presentation of this appetizer was also mind-blowing. It was literally like an art piece where the ribeye was the canvas and the rest of the ingredients laid on top of it meticulously like a fine art piece. The handiwork here at Alo was so skillful! We had a bread and butter course after this. We had a “Pain au Lait” where the butter was made with house churned cultured butter with a milk bread. 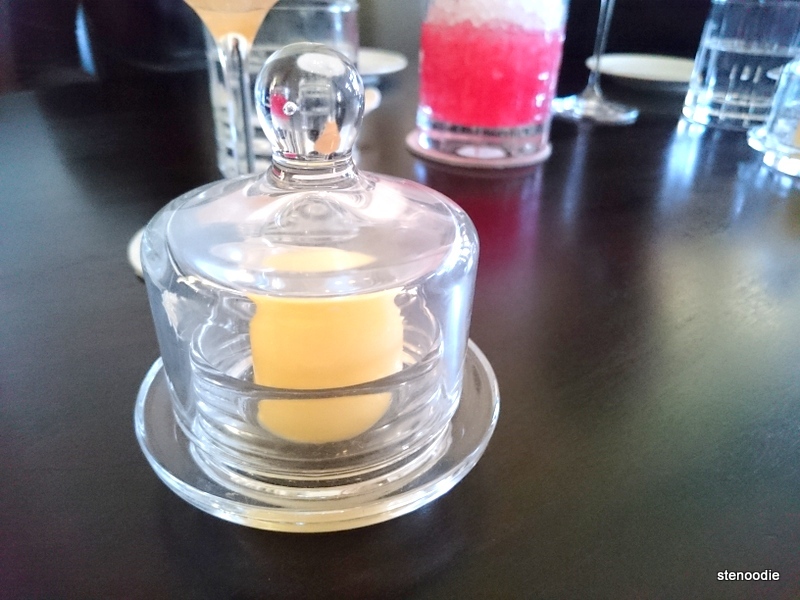 The cultured butter was placed into a cute little glass dome and was super soft and moist. 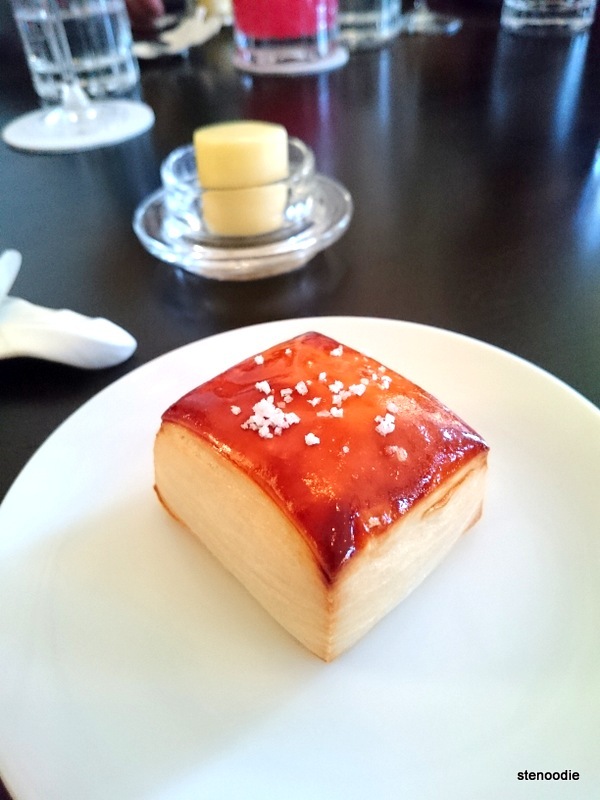 The “Pain au Lait” (milk bread) looked beautiful and we could see the layers even in the small square-shaped piece that we each received. There was some salt on the top of it. Pain au Lait – best milkbread ever! After this, we enjoyed our second course. 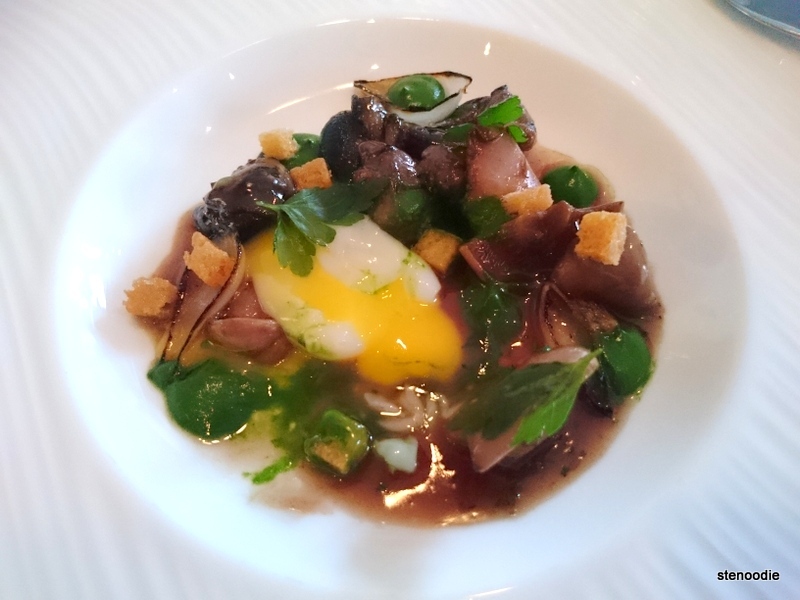 I ordered the “Burgundy Snails, Bluefoot Chantrelles, Parsley, Quail Egg”. This was a nice plate where all the ingredients laid flat in the middle of the plate. I liked the snails and the Burgundy sauce. The yolk of the quail egg was heavily dense and eggy. 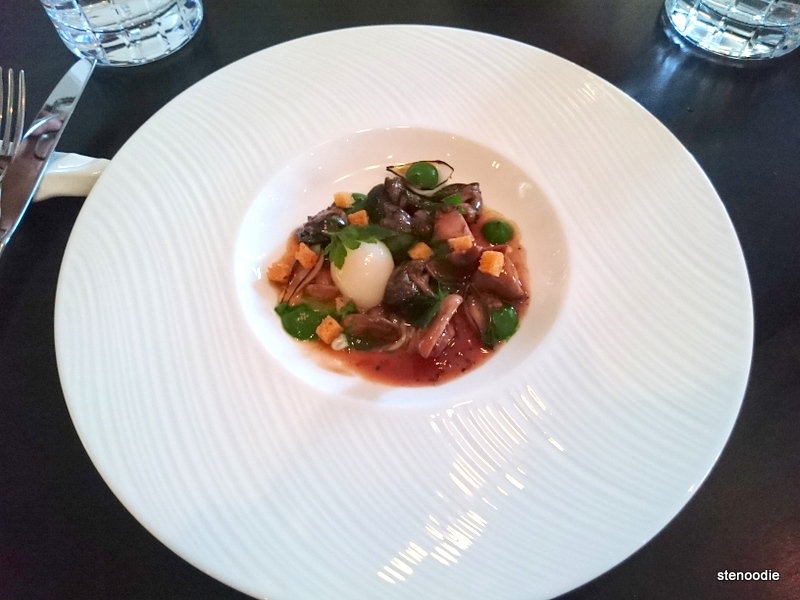 I love snails and escargots so this dish was definitely great. I also tried a mussel from the “Gallo Mussels, Pinenuts, Olive Oil, Serrano Ham” selection. This was incredibly tasty with the combination of flavours that were cooked into the Gallo mussel. 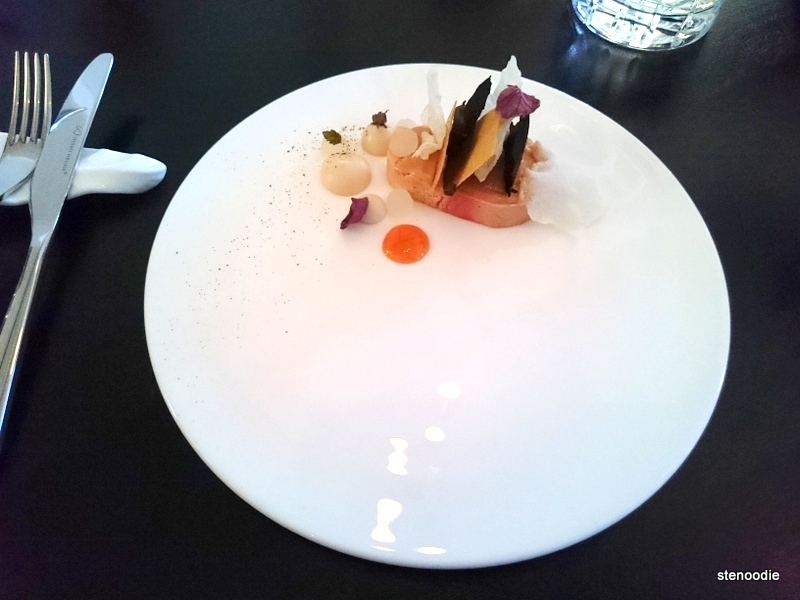 The mussel itself was tender and delicate with an emulsion on top of it. 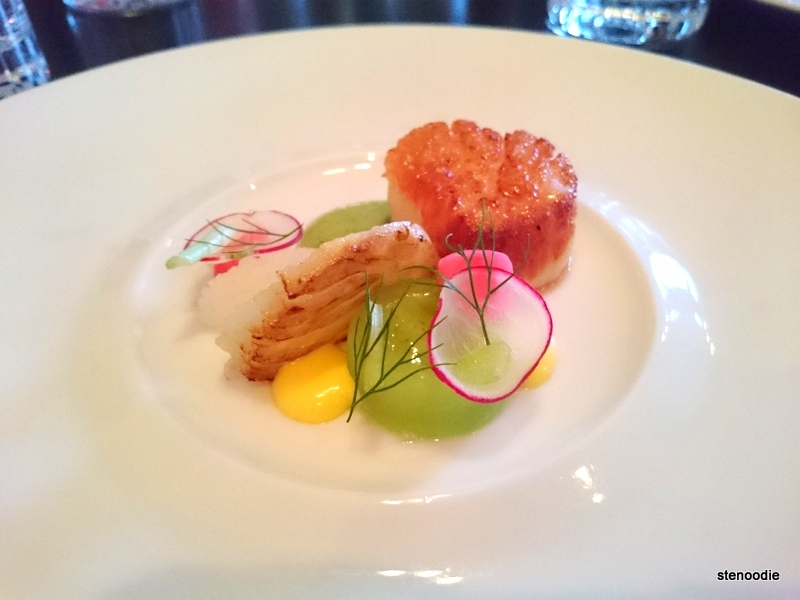 The third course was the “Sea Scallop, Fennel, Cucumber, Cured Egg Yolk”. Sea scallops are always a treat to have and I have tasted wonderfully cooked scallops (like when I was at Beast Restaurant and they cooked a perfectly tender scallop). 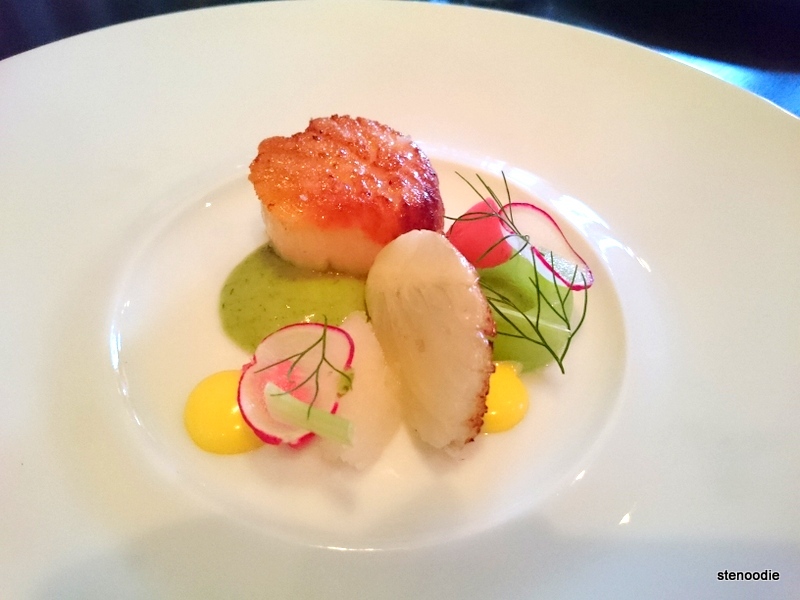 This Sea Scallop at Alo Restaurant was indeed cooked well so that it was tender and included some great flavour. However, I wasn’t a big fan of the fennel, cucumber, or rest of the ingredients in the dish. The vegetables were certainly fresh, as I expected them to be, so there was nothing else in this dish that I felt was over-the-top amazing. 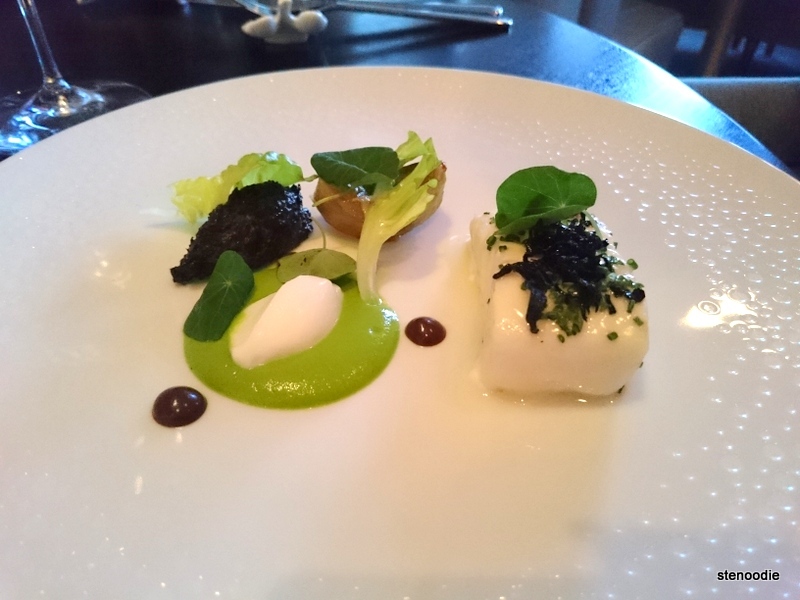 On the other hand, I tried the “Pacific Halibut, Bibb Lettuce, Black Trumpet Mushrooms, Artichoke” dish and felt that there was more detail and uniqueness placed into this dish. I did try a bit of the halibut and felt that the fish was well done. I didn’t much of the other ingredients but they looked really great; especially the artichoke. I think this would have been a better pick than the scallop if you wanted more variety in your dish. Very quickly, we were coming to our last savory dish for the night. I ordered the “Muscovy Duck, Treviso, Cara Cara Orange, Pistachio”. I tried the wine pairing with this one from Baron and it paired perfectly with the duck meat. It was a really great pairing! 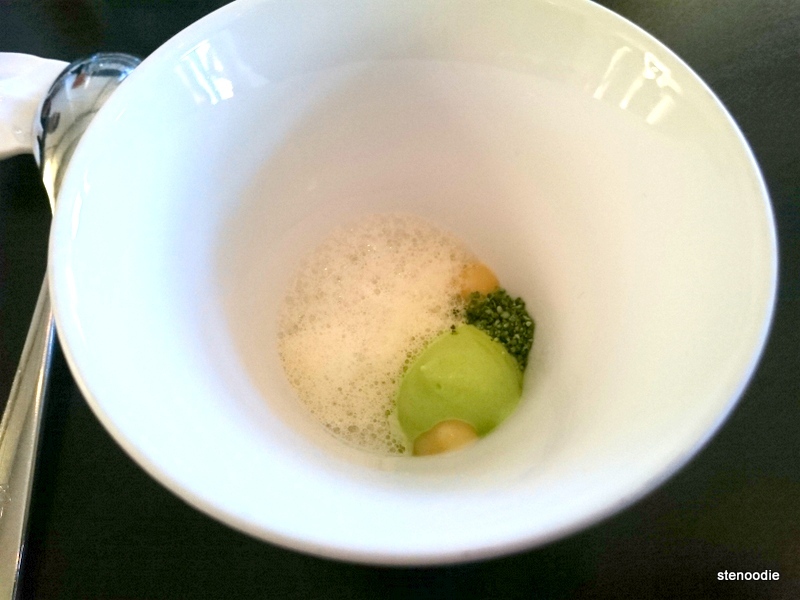 What I loved about this dish was the foie gras was encased in pistachio and molded into a little acorn shape. This was delicious. The duck meat was flavourful and tasted great. 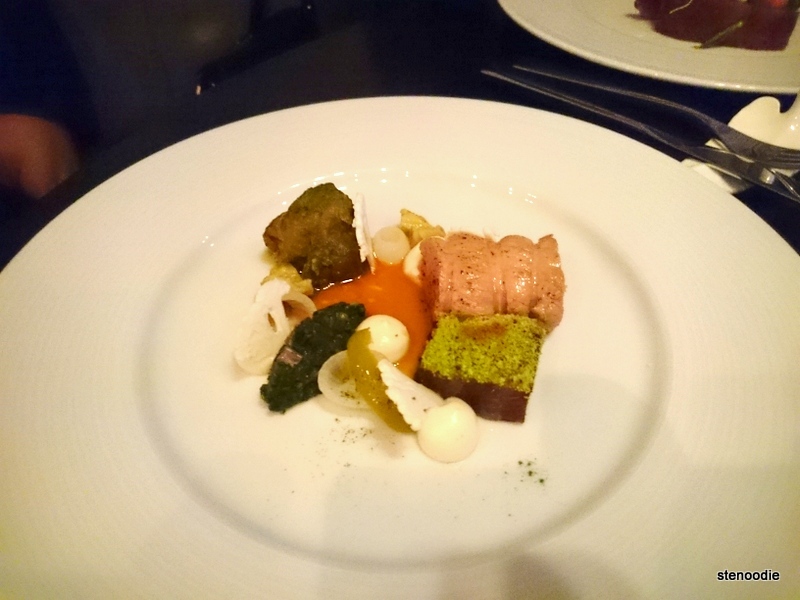 The other selection for this course was the “Provini Veal, Cauliflower, Swiss Chard, Cerignoia Olives”. I didn’t try this one but found its assembly unique and looked tasty. After the four savory courses, our server greeted us once more and informed us about the dessert choices for the night. There were two of them: a carrot cake or an rhubarb white chocolate ganache. Once I heard the word ‘ganache’, I was all in. Before our main dessert arrived, however, we were surprised with two sweet courses! The first one was another amuse bouche. 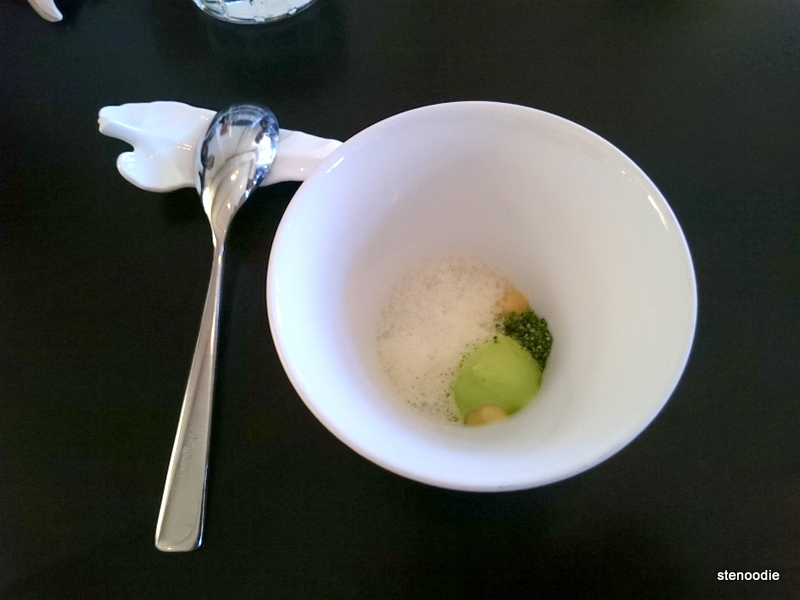 This one was placed into the same narrow bowl that we ate out of earlier for the savory amuse bouche. 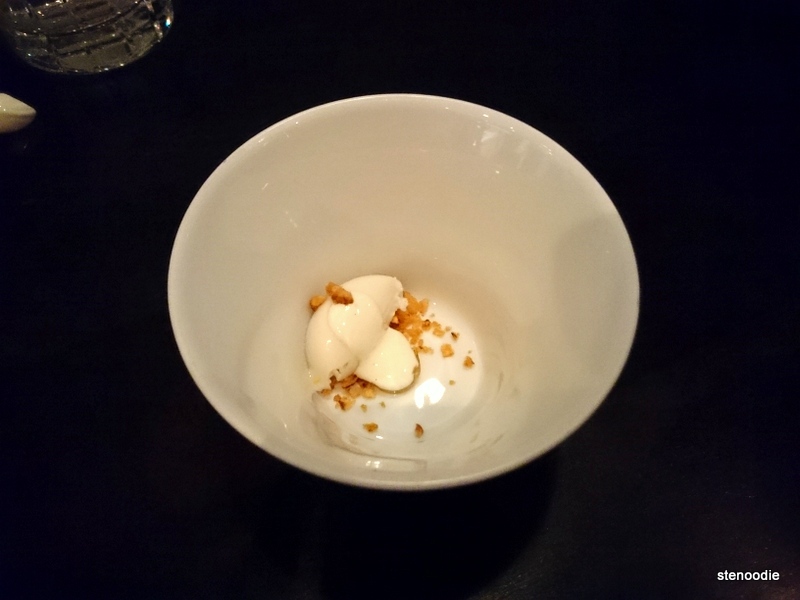 This amuse bouche contained “Sunchoke, Honey, Vanilla”. The vanilla cream was cold, making it a vanilla ice cream that was smooth and clean. The honey gel was unique and I really, really enjoyed it. The sunchoke (a type of sunflower) was crunchy and reminded me of the crunchiness that you find from eating certain cereals. 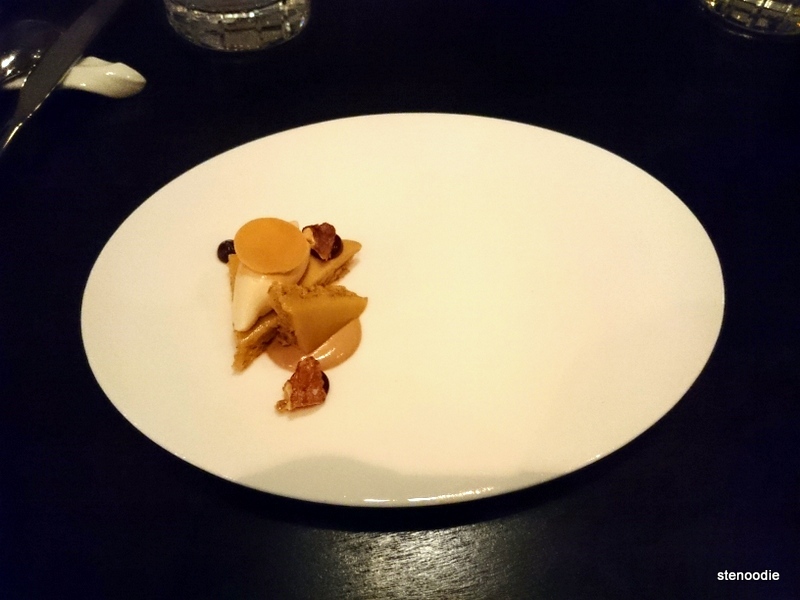 Next, we received a ‘medium dessert’ which included walnuts, expresso gel, candied walnuts. I am not even a fan of walnuts but I actually loved this dessert so, so much! Its presentation was again artistic and creative. All the dishes were perfected with such fine attention to small details. Finally, our actual dessert arrived. 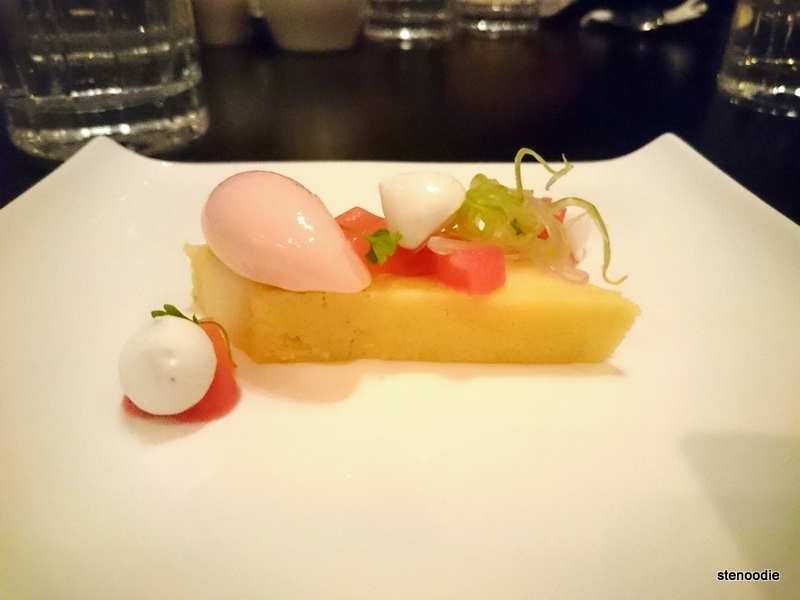 I ordered the “Rhubarb, Almond, Black Pepper” with the white chocolate ganache. This was actually a little underwhelming for me. The ganache wasn’t what I expected it to be; it wasn’t very sweet and its consistency tasted like a pudding in a block. The rhubarb sorbet was very delicious though and improved the taste of the ganache. 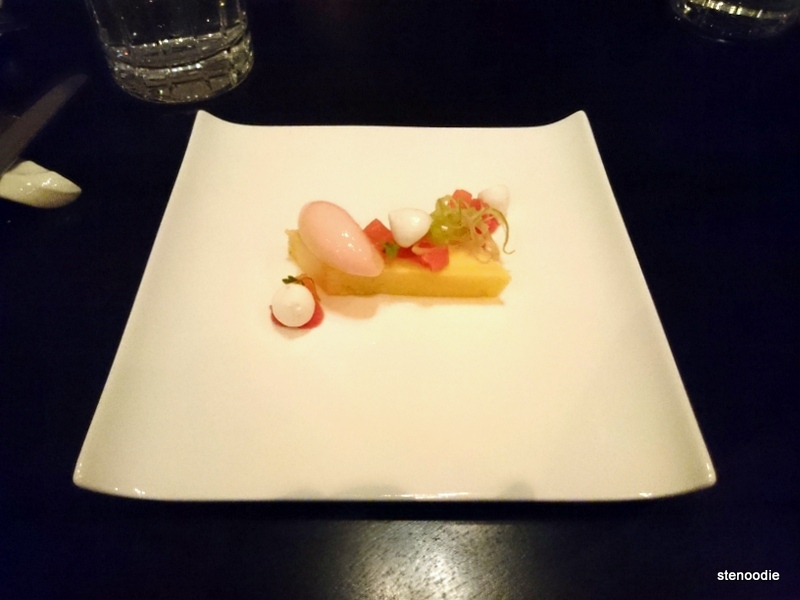 The fruits and vegetables in this dessert made an odd pairing, which was why those of us who ordered this dessert weren’t a huge fan of the mixture of flavours. The other dessert choice was the “Carrot, Clementine, Lemon Balm”. 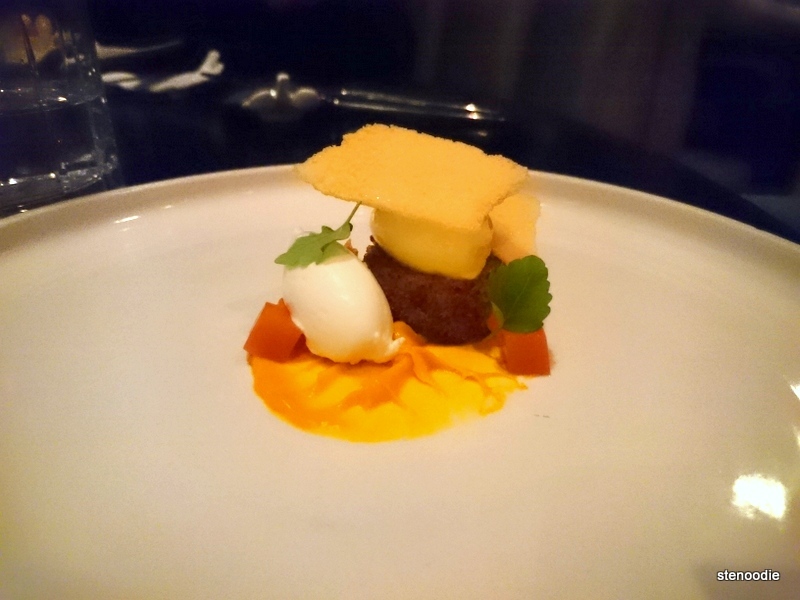 I tried the carrot cake with the lemon balm and loved it! I usually am not a huge carrot cake fan, but this one definitely took the ‘cake’! (Haha, yes, I’m lame :P.) I believe that this was the better dessert to order. And once again, all too soon, our foodie adventure for the night had concluded (the others also ordered coffee or expresso to go with their desserts). 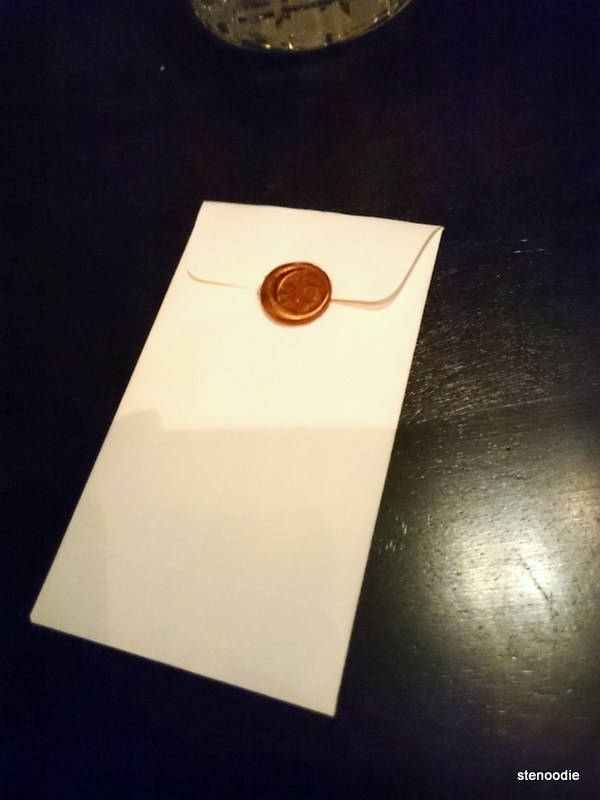 We were handed off gently with not only the bill (they were able to separate the orders for us; very gracious for that) but we also each received a little envelope with a waxed seal from Alo containing the menu of all the dishes we had ate that night. It even included the wine pairings for each course too! Wow! I was so impressed with that! 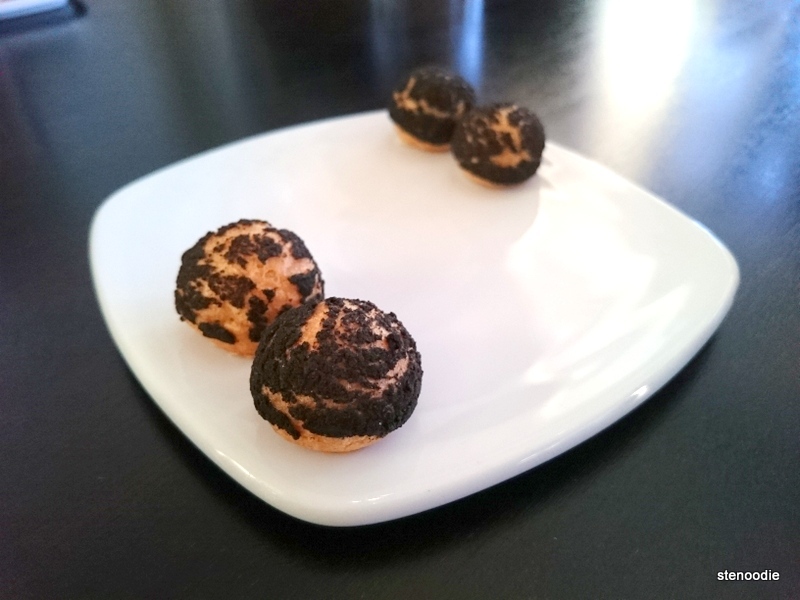 I really appreciated that a lot as a food blogger because it made writing this review so much more easy than if I didn’t have the full list of the things we ate (especially the amuse bouches). The others were actually expecting a surprise food/gift to take home as well as some of the restaurants do provide a parting gift. As we walked towards the elevator, we were given our coats from the coat check. We rode the elevator down to the ground floor again and reminisced on what a great foodie night that was (at least I did). 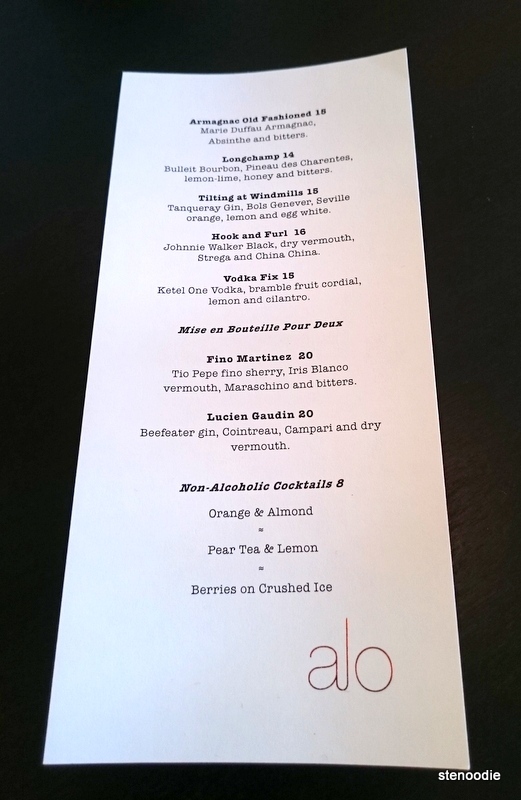 I really enjoyed my night at Alo Restaurant and their French tasting menu. For the price that it did cost me (an arm and a leg, $95, and that’s not even including tax or tip yet), I did think that it was worth it. 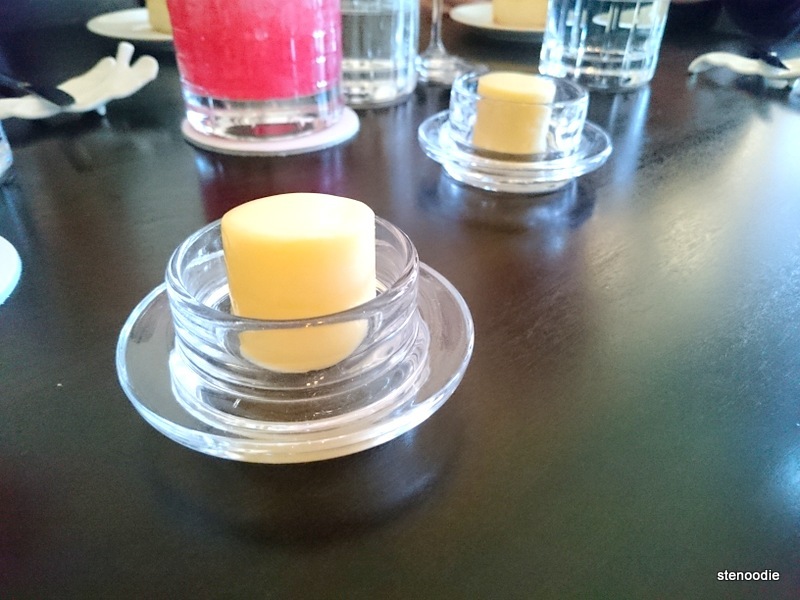 We not only had five amazing and well-crafted dishes, but also little dishes and surprises along the way. (Thus, it was like more like a ten-course dinner for that price which makes it a lot more reasonable.) The exceptional and professional service itself was worth the money because it’s not every day that you have someone waiting on you hand and foot. The servers were exceptionally attentive to detail and always made sure that our water glasses were full all the time. The staff was respectful towards all guests by stopping where they were and allowing the guest to walk by first and providing a genuine smile during the process. It was a really nice feeling to be served on like that, which shows an exemplary demonstration about the staff that work there and the care they devote to the restaurant. 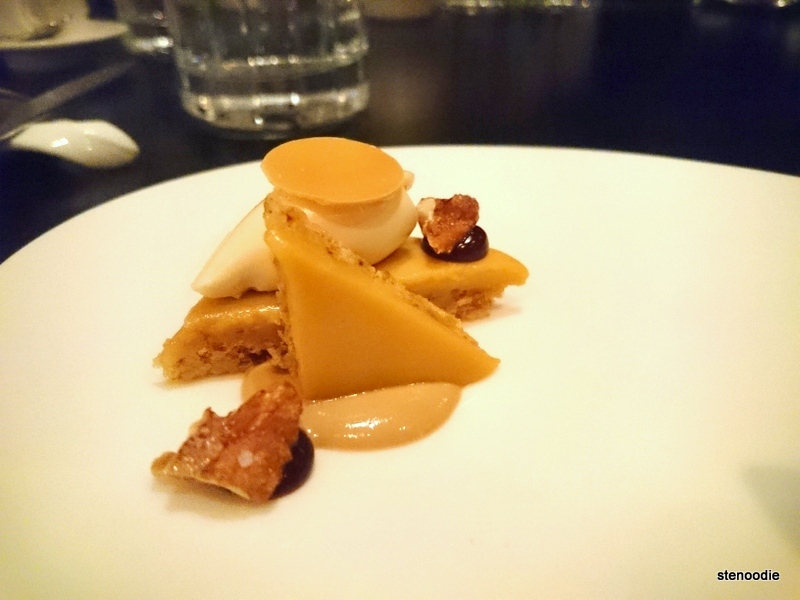 I’m so thankful that I got to try one of Canada’s top 100 restaurants (top 6th restaurant). 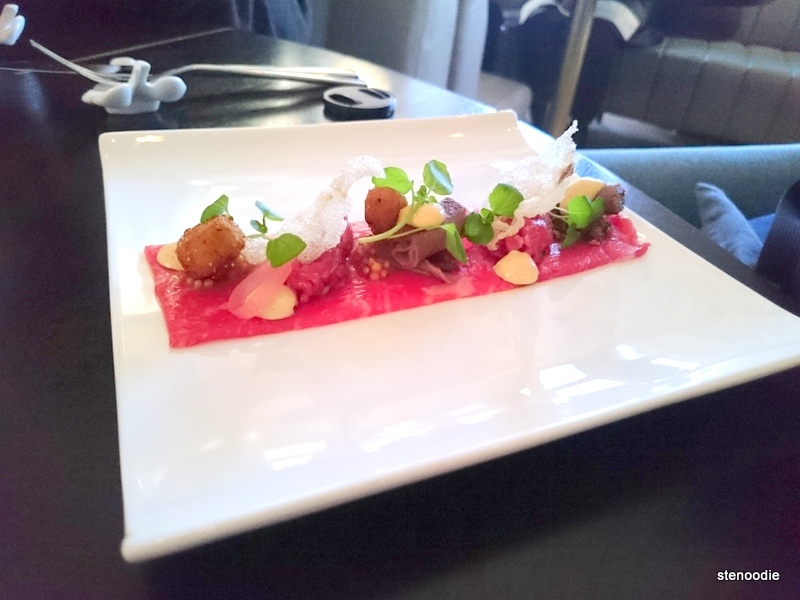 I actually would love to return to Alo Restaurant again in the future to try more of their food (and perhaps the wine pairings too since they did such a great job). Their menu changes every two months or so, and the ingredients actually may change week to week depending on the chef and the availability of the ingredients. Thus, it would be so great to taste their other dishes as well! Alo Restaurant reminded me of Splendido with their exemplary service and attention to detail in the food’s presentation (not surprising as the chef is the same one!). So much food artwork all night! My camera was full and content, as was I. This entry was posted in Food and tagged 163 Spadina Ave, @AloRestaurant, Alo Restaurant, Alo Restaurant price, Alo Restaurant reviews, Alo tasting menu, Amuse Bouche, best restaurant to take a date, best tasting menu restaurants in Toronto, Canada's best restaurants, Canada's top 100 restaurants, fine dining, fine dining restaurants in Toronto, food blog, foodie, foodie restaurants, French, French gougères, reservations for Alo wait time, restaurant review, Toronto, where to eat downtown, where to eat Spadina and Queen Street. Bookmark the permalink.